As you will have heard in the news, schools across the country are facing financial crisis. We are writing to ask you to support your child’s education by emailing your MP about this. The government says that education funding has been protected from the austerity cuts and that there is more money being spent than ever before. However, the reality is that while there is more funding set aside for education, this is because there are far more school aged children nationally. This hides the fact that the amount schools have to spend on each student has fallen dramatically. The Institute of Fiscal Studies warns that by 2020 funding per student will have been cut in real terms by 6.5% for schools. The funding we receive for each student is being reduced in real terms because the costs schools have to meet have risen. The increased costs are government imposed and beyond schools’ control. For example, there has been an annual 1% pay rise for teachers each year and employer contributions to staff pensions and national insurance have gone up significantly. There has been no extra funding to help schools meet these extra costs. State schools cannot raise their fees to meet the rising costs, as independent schools would do. Our only option is to make efficiencies. However, staffing costs are typically around 80% of our total expenditure. So the only way we can make savings of the size we need to is by cutting jobs and increasing class sizes. At a time when the curriculum and qualifications are changing radically, schools cannot afford to buy the new textbooks and resources they need. Many schools have slashed their budgets for repairs and maintenance and this will lead to our school buildings deteriorating. There will be less money to support students with mental health problems at a time when this is an increasing problem. If introduced, a proposed new National Funding Formula will make things even worse for Hertfordshire schools, giving them an even smaller share of the national allocation of money for education. Headteachers are not a militant group but even in affluent areas such as Sussex, Surrey, Essex and Hertfordshire, we are warning of an education system that will implode. 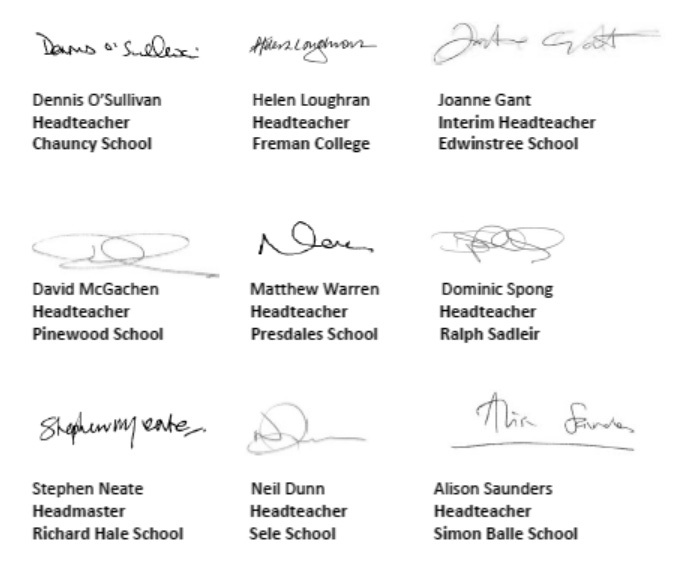 Across the country Headteachers are united in saying that we cannot run our schools on this level of funding. Headteachers are usually publicly optimistic; we quietly get on with making the best of whatever situation we are given. However, none of us can make the cuts we are going to have to make without serious consequences for our students. Many secondary schools will have to cut £200,000 – £300,000 from the budgets – the equivalent of losing 6 or more teachers. Now we are raising the alarm and asking you to explain to your MPs how desperate the situation is. Please support us in trying to protect your children’s education by emailing your MP at the relevant email address below* stating that you are a constituent and giving your address and telephone number, as this is required in order for the MP to reply. We suggest you ask them the following question.